The Colts have a 21-0 lead and a ridiculous 20 first downs at halftime against the Texans, and it would likely be 35-0 if not for two plays. The first came early in the second quarter. 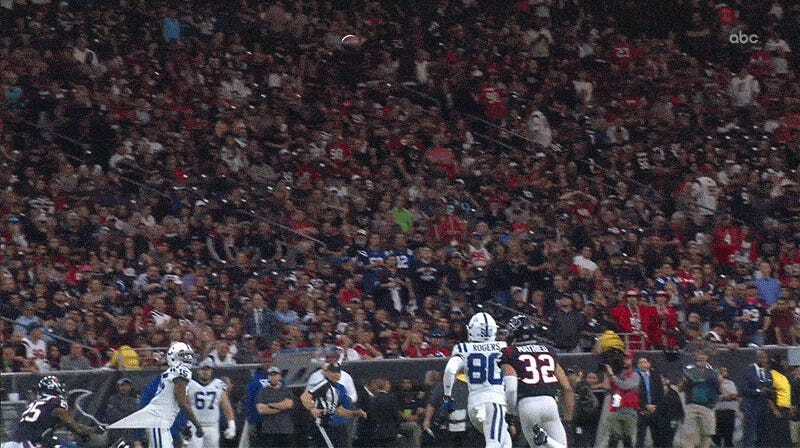 J.J. Watt tipped a pass that was eventually intercepted by Brandon Dunn. Andrew Luck missed a wide-open receiver in the end zone. The second is the play at the top of this post. At the end of the half, Dontrelle Inman got open for what seemed like a sure touchdown when Kareem Jackson wisely grabbed a fistful of undershirt; the clock ran out before the Colts were able to convert the drive into points. They didn’t punt once in the first half.